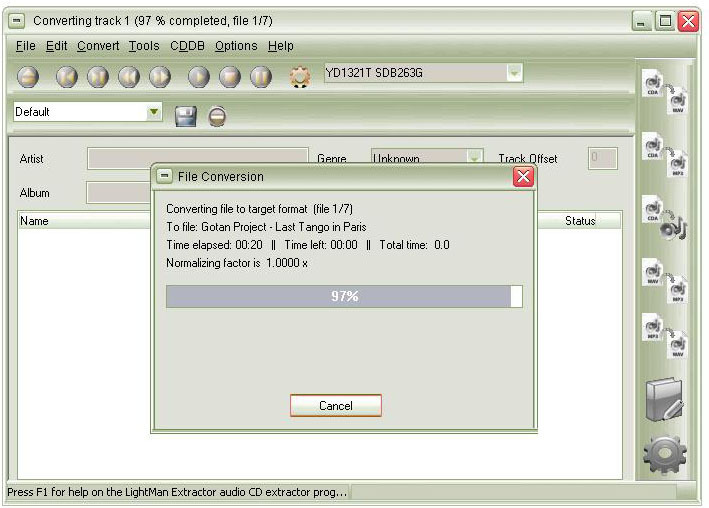 LightMan Extractor allows you to turn audio CDs into high-quality MP3s. You are able to get useful data about a particular music file using the CD's .ini file or through the online CDDB database - two time-saving solutions that spare you of having to specify track related info yourself. While LAME is the default encoder used by LightMan Extractor, you are able to add other various encoding tools for various formats to complete your projects. Starting with its interface - well structured and uncluttered - LightMan Extractor adapts to any user's needs and competence. LightMan Extractor's performance is fully digitally-based (it does not convert files to analog and then back to digital as other programs). LightMan Extractor works on any Windows platform. It's low resource-consuming and includes a built-in player for music files. CHAOS Self Extractor helps you to create self-extracting archives. Qweas is providing links to LightMan Extractor 1.6.0 as a courtesy, and makes no representations regarding LightMan Extractor or any other applications or any information related thereto. Any questions, complaints or claims regarding this application LightMan Extractor 1.6.0 must be directed to the appropriate software vendor. You may click the publisher link of LightMan Extractor on the top of this page to get more details about the vendor.